By 2019, revenue in the UK from Google display ads is set to reach over £5 billion. July Special Offer - Get a free short course worth €400 when you enroll on a diploma course this month. This specialised SEO course is a professional certificate delivered by some of the industry’s leading search marketing experts. Detailed and structured modules teach you the elements of search campaign planning, creation and measurement, along with an accredited certification to validate your new expertise. Upon successful completion, you will become a Certified Digital Marketing Specialist in Search. Now includes one year's exclusive access to our membership platform - with regularly updated expert level content connecting you with industry, peers and opportunities. Transform your career and significantly increase lead generation with the SEO training in our online Professional Diploma in Search Marketing. In just 30 hours, you’ll be an accredited search marketing specialist with the expertise to create, manage and implement advanced search marketing strategies using Google AdWords, PPC, display and remarketing techniques. You’ll understand the significance of key campaign metrics, perform analysis and optimisation of campaigns to increase conversions, and generate insightful reports to satisfy boardroom level stakeholders in your search marketing campaigns. Module 1 Introduction Learn how the core search elements, including search engine optimisation, pay-per-click advertising, and analytics, work together to drive targeted, high-converting traffic. Module 2 SEO Setup The SEO Setup module introduces you to the key concepts relating to Search Engine Optimisation, how search engines work and the key components of Search Engine Results Pages (SERPs). Module 3 SEO Content Develop an understanding of the technical aspects of onpage optimisation, enhance search traffic, and develop broader engagement levels across different digital marketing channels. Module 4 SEO Workshop The SEO Workshop provides a practical workshop on SEO. You will learn how to conduct a comprehensive SEO audit, to tweak your SEO strategy from both a technical and content aspect to improve your overall ranking. Module 5 Paid Search The Paid Search module introduces you to the fundamental concepts of PPC advertising. You’ll learn how to set up an AdWords account, interact with the AdWords interface and understand the AdWords hierarchy. Module 6 Display Advertising The Display Advertising module introduces you to the key performance indicators in display campaigns, including Click-Through-Rate (CTR), Conversion Rate, Average Cost-Per-Click (CPC) and Quality Score. Module 7 Video Advertising Explore Pay-Per-Click Video Advertising and investigate the opportunities for advertising provided through display networks, video hosting platforms, and mobile platforms with the Video Advertising module. Module 8 Analytics Setup The Analytics Setup module enables you to understand how to measure, monitor and optimise your website performance as well as your digital marketing campaigns for success. Module 9 Applied Analytics Taking your analytics knowledge to the next level, Applied Analytics will help you to develop your understanding of the more technical aspects of analytics such as goals, funnels and conversions. Module 10 Strategy & Planning The Strategy & Planning module will teach you how to devise an all-encompassing search strategy using the PROPEL strategy model. You will learn about the key components of a successful social strategy and ROI. Gaining a digital certification will assure you have the essential skills and knowledge needed to excel in Canada as a search marketing professional. Digital Marketing is a huge industry. I knew that I would have to certify my skills if I wanted to stand out against my professional peers. An exclusive network - and free part of your certification - delivers just-in-time training and continuous professional development, and an exclusive and evolving content library that can be used in your daily work. Do I need to have a marketing background?How much does the online search marketing course cost?Who should take this search marketing course?Where will my qualification be recognised?How is the search marketing diploma assessed? Do I need to have a marketing background? Anyone can apply for the Professional Diploma in Search Marketing. A background in a related discipline is not required – the aim of the online SEO course is to allow you to learn everything you need to know about search marketing; and to kickstart a new and exciting career. You may be a business owner looking to take your online marketing to the next level or you may be someone looking for a change of career. The only prerequisite is that you have an interest in a SEO/PPC marketing career. How much does the online search marketing course cost? The Professional Diploma in Search Marketing costs to study online. This includes all course content and the examination fee (first attempt only). Who should take this search marketing course? The Professional Diploma in Search Marketing is recommended for individuals who are responsible for the planning, execution or measurement of search marketing campaigns – search marketing specialists (PPC), search advertising (AdWords) and optimisation (SEO) professionals, or anyone who would like to pursue a career or enhance their marketing knowledge in this area. The course is suitable for participants with any level of skill or experience and will prepare them to engage specifically with search marketing within the overall digital marketing domain. Our qualifications are world class. This allows you to take your Digital Marketing Institute qualification with you, no matter where your exciting career may take you. 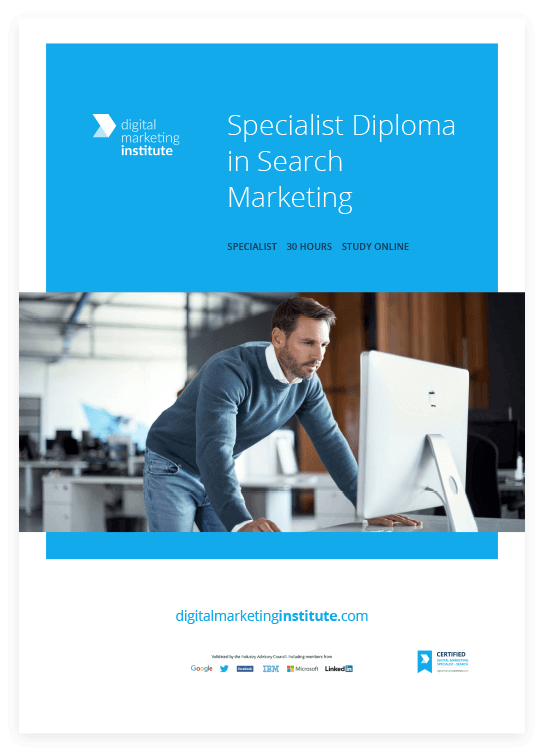 How is the search marketing diploma assessed? The Professional Diploma in Search Marketing is assessed by one three hour exam; these are administered by our computer-based testing partner, Pearson Vue, via its global network of test centres. Candidates need to achieve a minimum of 60% to pass the exam.